What are some of your family’s favorite Christmas books read-alouds? I’d love to find new ones to add to our list of favorites! ::If you have younger children, gather a basket-full of Christmas read-alouds and plan a daily time to read for 10-15 minutes. Let your children choose from the basket to make it more engaging for them. For additional fun, wrap up the books and let them unwrap a few each day. ::If you don’t have young children, choose at least a few Christmas-related books to enjoy over the Christmas season–either reading through with friends or just yourself. Jan Brett is a favorite. Check out her website for free coloring and activity pages! I went to the library and took out books for the advent countdown. My kids (11, 9 and 14 months) love it. Each night we open a new one up and take turns reading it. I liked Christmas Safari the most so far. We have liked the theme so much we may do a different theme every month. When I worked at a preschool, we loved Jan Brett’s books! I also like The Crippled Lamb by Max Lucado…basically anything for children by Max Lucado, The Miracle of Jonathan Toomey, The Legend of the Christmas Tree, The Parable of the Christmas Tree by Liz Curtis Higgs, The Golden Book’s Nutcracker – absolutely love the artwork! The Crippled Lamb is an awesome book! We also have a huge stack from the library. We’ve really enjoyed and . of all of our Christmas book suggestions. I love Mortimer’s Christmas Manger. I also love “The Real Reason for Christmas.” It’s especially nice because it’s a board book. Great for the littlest ones, but also for the bigger ones! My daughters and I love to read Christmas in the big woods by Laura Ingalls Wilder. As a matter of fact I bought a few other stories by her this year for gifts. Purchased used copies from Amazon for just a couple bucks each! My girls are going to love them. Our library will only let us check out 5 Christmas books at a time so we’ll be going back often this month! We love The Best Christmas Pageant Ever. It makes me laugh and cry every year. Two silly ones we enjoy are Womat Divine and The Christmas Crocodile. I loved the best christmas pageant book as a kid! I’m with you. We read best Christmas Pageant Every every single year! It’s our tradition. Last year, I had a college friend over for christmas and read it to him. He loved it so much, he begged me to bring it with me when I visited him this year for his wedding. Beecause of all the busyness, I never got to read it, and so I handed him the book and told him to keep it, on the condition that he read it with his wife and start a new tradition. I happen to have an extra copy in my library, so I won’t be skipping this year! We also love One Wintry night. It’s the story of the salvation of man through Christ condensed into a very short story book, written by the late great Ruth bell Graham. Watched the Best Christmas Pageant ever last week – my dear husband had never seen it. I cried watching it, he giggled like a kid. Love that story!! SHAZAAM!!! “The Best Christmas Pageant Ever” was one of my favorites as a child. My kids like it, too. We checked out the audiobook on CD from the library. “Clopper, The Christmas Donkey” is one of our faves! My Birthday, Jesus’ Birthday by Holly Davis. The true story of Christmas is compared side by side with a child’s birthday making it exceedingly easy for preschoolers to identify with Christ’s birth and what it means. Sadly, it is out of print, but once in a while the price on Amazon is reasonable. Right now it’s crazy! For years, I purchase Christmas books after Christmas for 50% off. We have quite a collection now. At the beginning of the month, I wrap all of our Christmas books and we open one each day throughout the month. I used to read each day, but now my 12 year old daughter likes to read the books out loud. I should mention that my kids are 17 and 12, and they still enjoy this Christmas tradition. I also really like ‘Great Joy’ and ‘The Christmas Miracle of Jonathan Toomey’. For older children (ages 6/7 and older) my absolute favorite Christmas book(s) are a 3-book series celebrating Advent. One book is read each year for Advent (giving you three years’ worth of reading). They are Jotham’s Journey, Bartholomew’s Passage, and Tabitha’s Travels by Arnold Ytreedie. The are SO exciting, my kids can barely wait each day for the next chapter. They literally BEG me to read ahead. They are a bit scary for young children and some parts of the stories can be very intense. Each chapter is followed by a short devotional. My entire list will post on Friday, but we love the Crystal Bowman books!! We love so many! A lesser-known favorite is “Santa Calls” by William Joyce. I bought my mom ‘God Gave Us Christmas’ (by the same folks who brought us the polar bear story ‘God Gave Us You’) to read to my niece and nephew that she’ll see this year. She said it is great! I bought it from christianbook.com for $3.50ish–it said it was damaged, but she says it is in perfect condition! The Night Before Christmas, the edition illustrated by Niroot Puttapipat. I pick up holiday books of any type all year long at garage sales and have quite a few nice Christmas books. (LOVE the idea of wrapping them!) One of MY favorites is Christmas Day in the Morning by Pearl S. Buck, a story describing the true simplicity and joy of gift giving. The second of our favorites is Snowmen at Christmas by Caralyn Buehner, a beautifully illustrated joyous book told in rhyming poetry form telling a tale of the lives snowmen have once everyone goes to sleep at night. Each page spead has hidden pictures to find of a mouse, santa, cat, rabbit and t-rex makinging it not just an enjoyable read but a fun, interactive eye-spy game for children and adults alike. We love The Night Before Christmas, The Littlest Angel, What Snowmen Do At Night, and The Polar Express. I forgot about The Gingerbread Boy. I’ll have to see if the library has it when I go today. We use our books as an Advent calendar of sorts. I made 3X5 cards with stylized numbers on them, 1 to 24, which I then laminated. Every year the cards get randomly placed inside books which are then ready one by one through the month. Some of the books are new, some are older (having belonged to my own father) and some are “kids books” – Little Goldens and the like – while others are more adult. I have no problem reading portions of “A Child’s Christmas in Wales” or “The Gift of the Magi” to my kids, though, so it all works out. A fun tradition! My first grader is reading gingerbread stories in school. Her class loved the Gingerbread Pirate. We just read “The Legend of the Christmas Tree” by Rick Osborne. Beautiful book. Highly recommend. Oh we too LOVE “The Christmas Miracle” by Jonathan Toomey! My sister’s book has a CD with it and we listen to it several times a week. The narrator does such a good job in capturing the emotion of the story. My boys love the Jan Brett books, especially Gingerbread Baby. We keep our Christmas book with the decorations. We are so anxious to get them out each year! It is great motivation to get the house ready early for Christmas because we pull out the books when we get out the decorations. It also makes them extra special at this time of year because they are packed away for so long! Each year it is like discovering a wonderful box of surprises. I used to do that. In fact I still keep the books with our decorations, but my kids are way past the reading stage now. I really miss reading those children’s Christmas books. I may just have to read them to myself. Wish we could check out a bunch of books from the library. We are limited to two holiday books at a time. Guess I need to check half price books for some of these. I can’t believe this one is not up here yet because it is fantastic: “Humphrey’s first Christmas” by Carol Heyer. The pictures are beautiful and the Christmas story through the eyes of Humphry the camel is both heartwarming and reverent. Love the mix of silly (the camel telling the story) and keeping the story of the Christ child first priority! 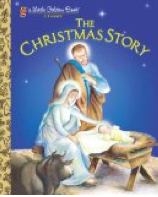 We love Christmas in the Manger, its geared for toddlers, but its a wonderful little book. My five year old has asked me over and over to read “The Legend of the Candy Cane” the last few days. I love “The Snowy Day” by Ezra Jack Keats. I also have several Ideals Publications Christmas issues. One is from 1964 and it’s a favorite! We buy a new Christmas book every year. This year our choice was “The Snow Angel” by Glenn Beck. There is an adult and a child’s version of this story. I am super excited to share this with our kids. We will pull it out the fourth Sunday of Advent as our final countdown week to Christmas begins. Thanks for the great list and to all the other readers for their wonderful suggestions! It’s not a read aloud, but my children always enjoed the Christmas I Spy book. We would sit together and do one page each evening before Christmas. We have the Gingerbread Baby – I LOVE the illustrations! My favorite, though, is God Gave us Christmas. It’s about a polar bear family and is cute, fun, and has good illustrations. While mentioning Santa Claus, it does a great job of re-focusing on Christ. Perfect for our culture when my kids get confused about WHY Christmas – Santa or Jesus. Our favorites are ‘The Miracle of Jonathan Toomey’ and ‘The Legend of the Candy Cane.’ Both have such beautiful illustrations and a wonderful meaning. Mortimer’s Christmas Manger, The Night Before Christmas, Owl Moon, Santa’s Little Helper, The Christmas Hat, Christmas I Spy. But my daughter’s favorite is called ‘Advent Storybook, 24 Stories to Share Before Christmas’ by Antonie Schneider. There is a different one-page story each day from the perspective of a little bear who is following the star to Bethlehem. God Gave Us Christmas by Lisa Tawn Bergren is my #1 pick. Just found a gem at the library that I plan to add to our collection… The Legend of the Christmas Rose by William H. Hooks. The Christmas Miracle OF Jonathan Toomey was also made into a super cute movie, by the way! One of our favorites that hasn’t been mentioned is Morris’s Disappearing Bag by Rosemary Wells. I had it when I was a kid and it is frequently pulled out of the stash of books by the kids. We have a binder with 25 Christmas stories typed in it – one for each day a song and scripture to go with it. The stories take about 5-10 minutes to read. Many are popular Christmas stories and they all have a good message. I hadn’t thought of it before, but maybe it would be a good idea to scan them and make them available over the internet if people were interested. I read the “Little House on the Prairie” series to my children several times, and we often started it at Christmas because there are so many great Christmas stories in that series. I put our Christmas-themed books away with the Christmas decorations in early January and then they are ready to be pulled out again the day after Thanksgiving (when we decorate for Christmas) the next year. This way they are “new” each year and don’t come up missing. I just shared our favorites on my site. We try to focus on books that center on his birth, simple living, and the real meaning of Christmas. Christmas tapestry by Patricia Polacco. Awesome read! We have a basket in our living filled with Christmas books. Right now my son’s favorite is If You Take a Mouse to the Movies. I would have to say as a third grade teacher, any Patricia Polacco book would become a quick favorite! A Tree for Peter is a classic, old fashioned book about giving and not judging others. I love the Patricia Polacco book, “Christmas Tapestry”, too. She has written another Christmas book entitled, “An Orange for Frankie”. “The Year of the Perfect Christmas Tree” by Gloria Houston and illustrated by Barbara Cooney is sweet. Two books for upper elementary readers are “The Hundred Dresses” by Eleanor Estes and “A Penny for a Hundred” by Ethel Pochocki and illustrated by Mary Beth Owens. During the Christmas season my 15 year old daughter and I stop our homeschooling day at 2-3pm and have a Christmas Tea with a Christmas story read-aloud. Any book from the Joe Wheeler series, “Christmas in My Heart” are also very nice family read-alouds. I read your blog all the time…and have for years…but never respond until now. My girls and I love The Last Straw bu Fredrick Thury… and Room for a Little One by Martin Waddell… . We save them just for this time of year…and both make me choke up every time. Merry Christmas to you!! I also like Twas the Night Before Christmas and The Nutcracker…and several others that have already been mentioned. I couldn’t believe anyone didn’t put “How the Grinch Stole Christmas” either. My father read it every year on Christmas eve since I was a child and I have with my kids (it will be my 40th time reading it on Christmas eve this year). As kids we would see who could get the furtherest in the book from memory. I love how it focuses on how we can be happy and enjoy Christmas without “the ribbons, the wrappings, the trimmings, the trappings…it came just the same”. I love “How the Grinch Stole Christmas,” too! My mom used to read it to me. The Crippled Lamb by Max Lucado is a wonderful one for preschoolers. For older (and parents), Mary’s First Christmas by Walter Wangerin is beautifully poignant and a wonderful fresh perspective of our Lord’s birth! One Wintry Night is our favorite!! Follow the Star by T. Jakes. A quick read that will delight! I had a quick question for you – sorry if you answered this somewhere else. I just noticed that there were no Santa books, and I was wondering if you do tell your kids about Santa. I am pregnant with my first and do not want Santa in my house, but I was wondering if it was possible to do without a lot of scoffing from outsiders (not that I really care). Or if it is hard when everything seems to be Santa-orientated. LOVE collecting Christmas books and keep them out in baskets around the house for savoring together by the light of the Christmas tree. Love Usborne’s “That’s Not My Reindeer” & “1001 Christmas Things to Spot”, Wm Joyce’s “Santa Calls”, C. Buehner’s “Snowmen at Night”, M. Waddell’s “Room for a Little One”, D. Wood’s “Merry Christmas Big Hungry Bear”, M. Lucado’s “One Incredible Moment”, R. Sullivan’s “Flight of the Reindeer”, “R. Evans’ “The Christmas Box”, J. Newcombe’s “A Christmas Treasury”, and Debbie Macomber’s Christmas books. Something for every age. One of my favorites is Mary’s First Christmas by Walt Wangerin. I love the story, and the illustrations are just luminous!